Alas, it doesn't end there. In theory you can use parental controls to configure managed accounts so that a managed user can change their password. In practice, when I do that, the managed user cannot click on the Accounts PreferencePane (it's grayed out). So the setting to enable password change does nothing. Lastly, if you switch a user from managed to standard so you can change their login password and keychain password together, OS X loses all the allowed and disallowed websites configured in Parental Controls. If you switch back to Managed User you start over. Apple's Parental Controls have been broken in every version of OS X I've used. I think they last worked in Mac Classic version 8 or so. Why, oh why, can't we customers be more demanding? Amen! I am fighting the first problem you mention -- i suspect it occurs when the database (the location of which I've forgotten) gets too big. An unfortunate thing about so many goodies being included in the OS is that it is hard for any particular feature to seem like a priority or not according to whether people like it. Does Apple lose sales if Parental Controls doesn't work quite right? Perhaps in avery roundabout way, and probably not as much profit as it takes to fix it. Perverse incentives. At least the freebies are (IMHO) more plentiful and better than certain other OS's. Great comment on the perverse incentives. iChat, iCal, Parental Controls and a number of other OS X "add ins" have destroyed the competition -- but still don't work. Apple has almost no incentive to fix them. 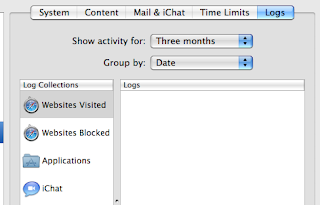 I'd love to see iChat in particular dropped from the OS.